Orlandus Lassus, AKA Orlando di Lasso in Mons, Netherlands in 1532. He spent most of his life in Munich, Germany until his death on June 14th, 1594. During his youth he trained under Ferrante Gonzaga, possibly as a singer in a church. His life consisted of singing in church choirs, and being a Choirmaster. 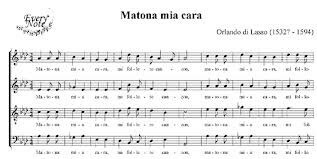 He wrote the famous "Matona Mia Cara" and was supported by a Patron of the Genoese merchant group, after writing his "Opus I" He is closly linked to Humanism and individualism. This piece shows humanism and individualism. The lyrics and message are not about God or its image but rather a beautiful woman. The lyrics also describe Orlandus "sleeping with the woman all night long, show his status as an awesome and cool individual.The exact date this piece was created is not known. 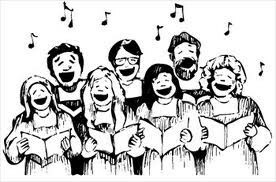 It is still sung by choirs and musical groups. It is significant because it has a very individualistic message. I find it interesting because the translations are all, consistently, very dirty.